It’s an exchange repeated throughout boxing history, so many times that it’s impossible to pin down to one pugilist, but it still sounds cool whenever it is brought back. That brings us to Maycee Barber, the newest member of the UFC’s strawweight roster. 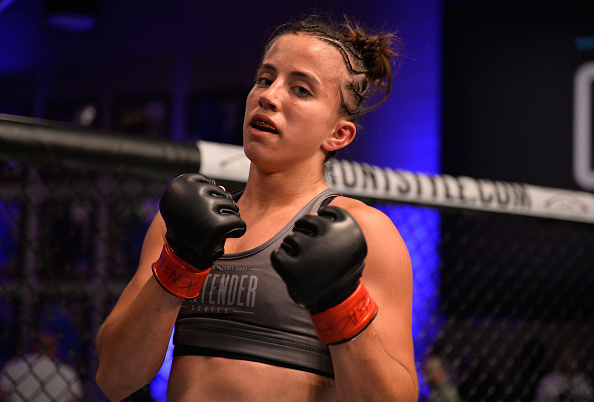 The 20-year-old earned that contract with a July 17 stoppage of Jamie Colleen on Dana White’s Tuesday Night Contender Series. So Maycee, when did you know you had the UFC contract? “I knew I had the contract before I even had the fight,” she said. “When I was told I was going on the Contender Series, I said I’m not just going in to win a fight; I’m gonna win a fight, but I’m also going here to get the contract. If that sounds like a young lady on a mission, that would be accurate. And when she says things like that about the contract or about her goal to become the youngest champion in UFC history, it doesn’t come off as cocky. It’s almost matter-of-fact when coming from the Colorado native, who makes her UFC debut in her home state against Maia Stevenson on November 10. And frankly, despite only having five pro fights, ask those in the business about Barber, and they’ll likely tell you that her nickname, “The Future,” is as accurate as it gets. But having people say good things about you and believing them yourself are two different things. Barber is a believer, and she knows exactly where her confidence comes from. Confidence will get you a long way in anything, including mixed martial arts, but while confidence can put you in a position to succeed, when the Octagon door shuts, you have to be able to back that confidence up, and Barber has done just that on her way to a perfect pro record. It may seem remarkable for someone so young, but Barber didn’t just fall out of the sky like this. Her journey began a long time ago, and even then she had big dreams. But they only crystallized when she was in her late-teens and decided to set her sights on the record Jon Jones set when he won the UFC light heavyweight title in 2011 at the age of 23 years and eight months. And yes, Barber knew that information off the top of her head, not me. A year later, she’s even better, which makes her even more confident that she won’t just make a run at Jones’ record, but set a bar that may not get reached for a long time. Barber sounds like she’s enjoying every part of this journey, and why not? She’s not even 21 yet and she knows what her life path is for the next several years. A lot of people her age can’t figure out what movie they want to see this weekend, and even more twice her age still haven’t decided what they want to be when they grow up. Having that clarity isn’t lost on Miss Barber. And it should only get better from here. But when does “The Future” become “The Present”?